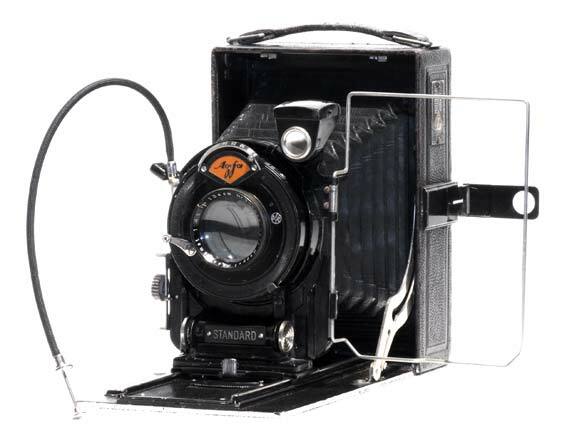 The Agfa "Standard" folding cameras have been produced from 1926 to about 1933, in a wide variety of versions differing in combinations of shutter/lens, finish and type of support. Any “Standard” camera can be easily identified by the label "STANDARD" which appears on the handle underneath the lens panel. The presented model is a Standard - Type 208. It used glass plates in a 9x12 cm format. However, it was possible to use it with a 120 rollfilm back. It is equipped with an Automat shutter and an Agfa Doppel Anastigmat lens of 1:4,5 f=13,5 cm. Other versions were proposed with a 1:6.3 aperture lens and/or a Compur shutter and in a 6.5 x 9 cm format (Type 204). This camera exists also in a “Deluxe” version. It has the same characteristics than the regular model (204 or 208) but it has a brown leather covering and brow bellows. The cameras of the Standard series have the famous Agfa focussing system moving the lens via a lever at the 10 o'clock position from the lens panel. This system offered a much quicker focussing compared to other cameras having a focussing gear with the tram tracks. Unfortunately, most of these cameras have today their focussing system totally stuck solid. This is due to the particular green grease that Agfa was using in the past which changed into strong glue with age. If you are lucky, some drops of alcohol will be ok to release the helicoid screw; for severe cases, the only solution is to dismount the whole system and clean each part. This camera belonged to someone who had c.1930, a true passion for photography. As any passionate person, this guy was performing the photographic process from A to Z, using his own plate enlarger to produce paper prints.